are you saying you will pay top dollar for people to simply follow some rules????? When if you have a simple set of rules that can be easily replicated and followed with very little discretion then UNLESS it can be shown that by using discretion and overriding those rules someone can get a better performance than the application of the rules then the default position should be to follow those rules.....why then dont people follow those rules? I think (and going back to your first post and linking it to here) is you are looking at the difference of why people need to meddle and make excuses when given a system....as opposed to the mental aspect required to actually do the work of understanding....and this is where the hard work is. People don't follow rules and profitable systems , even if they are paid to it.The typical trader will not follow it or trade it exactly as it was intended. Why not? Because the system didn’t fit them and their style of trading.One of the biggest secrets of successful trading is finding a trading system that fits you personally. Developing your own system allows compatibility with your own beliefs, objectives, personality, and edges. I have a system that makes pips on back tests , so I paid peanuts and hired a bunch of monkeys .The system made 30 % in a month of back testing .I know the system can be implemented in live trading , and can make 30 % every month without compounding and can be repeated every month . Zuppy will given a yacht and a flat in Peurto Banus. Where can I find the right people to implement my system?I am from a family on this list. Sorry....you are from a family on this list and you cant find someone to implement a system that makes such good money....????? If you are from a wealthy family then you might have a better chance of finding the right people at the hedge funds that already trade and manage money for such families. Put the onus on the to find the right people implement the trades and have them explain why the live trading does not match the back tests. So you have not tested this live? You supply the risk capital I will push the buttons. Happy to be a robot if its that good. now let me put my non believer skeptical hat on for more due diligence. I have not found the right people to implement the strategy .I found true idiots like in the first post to implement my strategy , I gave them an advanced version of that strategy and the fist post is truly them. I can't implement it because it is a 16 hour day , and I have another occupation.I have loads of commitments during the day and often have a week's holiday here and there.I work on developing strategies , training staff and putting up with their idiocy and mistakes and all the disruptions they create,I trade on and off , but not fully focused.I am sometimes really tired and have to put on trades , because the idiots are useless ......they complain about the systems and don't make the calls and put on trades. I am experimenting this week with four staff , 2 in the morning and two in the afternoon , one gives the signal and the other inputs in each session. Hedge funds can borrow at 5 % and don't need to give away 350 % a year to clients. 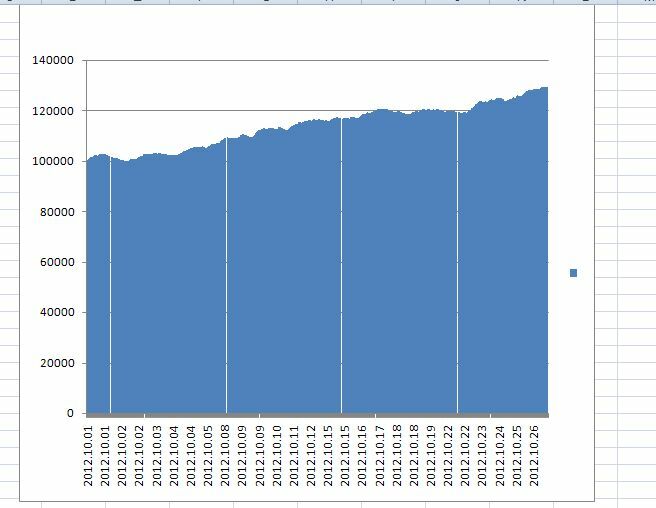 It is scale able.I have tested the basic system and observed it , it makes a good 75 pips a week (The system has 3 versions and the total pips it makes is about 300 pips a week with very low draw downs ).If I can make it work , I can set up hedge funds within the banking family of mine. 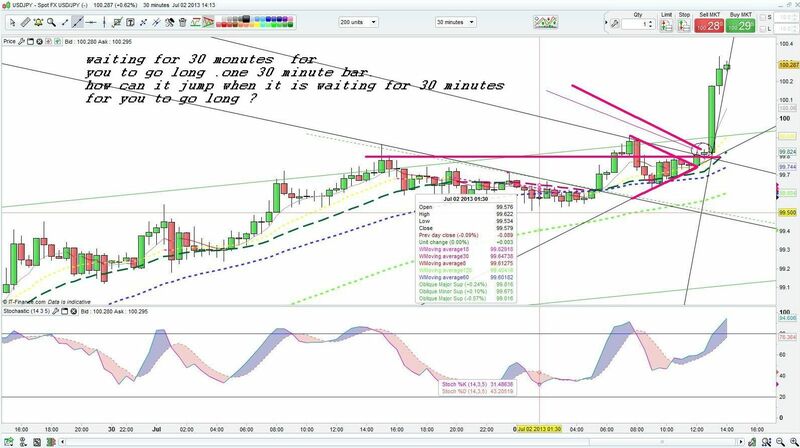 I will give you an example of my testing , here is a signal on usd yen on far right of the image.I was away on an errand and came back and asked the idiots "what is wrong with USDYEN trade ?The idiots replied the Usd/yen jumped "It was sitting there for 30 minutes for the idiots to take the trade and they did not.This trade would make 50 pips , but the idiots were dwelling on a late entry and lost 15 pips , my net loss being -65 instead of a profit of 50.The system is good and profitable , but everyday day the idiots screw up. We can get together sometime for a meal in London .I am in London.I just need a mechanical emotionless robot to execute my system. Here is 30 % return results for 1 month on back testing , live accounts I have idiots to screw up. A chimpanzee could have followed those instructions. We spent a fortune working with motivational consultants, developing our training and marketing materials to convince the affiliates to follow the plan. So what happens, well 95% of those registering as affiliates earned zero. Most would have lost money after paying for expenses. Out of over a quarter of a million registered affiliates, maybe 100 made chump change, 10 made less than the salary they'd get for flipping burgers, 3 made in excess of a million dollars per year, and one regularly made in excess of 500k a month. I talked to hundreds, probably thousands of these people, and in almost every single case, they changed something about the process. I've talked to dozens of other people running similar businesses, and there experiences are the same, people will not follow instructions even when there's overwhelming evidence that its in their interests to do so. I remember as a new graduate discussing the objectives i needed to meet to achieve promotion, did I do it ? No I didn't, I winged whined and moaned about not being promoted (along with the 50 or so other graduates who behaved just like me) watching the one guy who did actually do as he was told promoted into the stratosphere ! There was a guy on moneytec 10 years ago who tried to set up some sort of industrialized forex process. IIRC this guy owned a factory in the Philippines making hard drives, and he had people staring into high magnification microscopes hand soldering very small wires onto the drives. The people doing this work where working 12 hours a day in the most appalling conditions. His argument was if his employees could be managed and controlled to work under the conditions necessary to manufacture those components, then staring at a screen watching for set ups for 8 hours a day would be child's play. Did it work, no it didn't and it failed because his people wouldn't follow instruction, OR they quit after their first profitable day believing they knew enough about the process to trade in their own account. Personally, I think you could design a process, and you could monitor that process for compliance but the resources required to do so would be better spent elsewhere. I was chatting to someone this weekend who designs process control systems for a large electronics manufacturer, and he was telling me that they incorporate functionality into their production facilities that is totally useless and designed NOT to actually function. For example, if a particular process requires a temperature to be set, and that temperature should be 700 degrees, then the system automatically sets that temperature. However, the machine has a dial on the front that allows the operator to set the temperature, and it has a display that shows the temperature selected by the operator. So If the operator turns the temperature up to 750 degrees that's the temperature that the display will read, and if they turn it down to 650, that's what the display says. HOWEVER in reality, the temperature always stays the same, and the changes are just an illusion. They monitor this stuff all of the time and their operators are constantly overriding the settings that they are instructed to use, despite the fact that whatever settings they choose it has no actual effect ! Basically, the guys on the production line just won't follow instructions, and the only way they can get around this stuff is to create an illusion that the operator is having an input into the process. I worked in Japan very briefly, and whilst they are 10,000 times more likely to follow instructions, even there Ive seen some crazy stuff you just wouldn't believe. If the drawdowns are ok, and you want to cut me in for 40 percent I'll trade it for you, but it'll cost you a lot more than a boat and flat in Spain ! Within a few years the account will be £10m , so sliding scale might be more appropriate on the compounding. There are profitable automated systems, some are even written in MQL 4 ! But leaving that aside, you now seam to be describing a mechanical system operated by 3 independent people. How does that differ from any other automated system ? And how does 3 people following simple mechanical rules suddenly become an art ? Where's the art in performing a simple clerical job ? Who exactly is calling the trade entry ? Is this some 4th person ? And how can they ever enter a trade if person 2 has to confirm risk reward etc. I don't want to discourage posts in this forum, but they lap up this sort of mumbo jumbo over at the zoo, I'm sure they'd love it. Which of the statements are agreeing with?There is too much mumbo jumbo in the Zoos? Your post confirms that people find it difficult to follow systems ,so how can you guarantee you can follow systems and specific rules?Following the rules is a clerical job that does not justify 40 % of $10m. Disciplined army staff do not command $4m , they can do this type of job under stress and duress. What guarantee is there , I will not be given the same headaches as in the first post? I trade an automated system, and most of the actual work involved in that is monitoring performance against the range of expected returns. Its automated for that reason, because I can't follow instructions, and that's ok if I'm trading relatively small amounts for fun, but its not something I want to be doing when I'm answerable to others and managing risk on their behalf. The reason I can follow my own rules, despite those rules being less effective than my own discretionary trading set ups, is because I know the edge works, because I developed the concept, I developed the technology, I developed the compliance procedures etc. I agree, a monkey should be able to follow the rules, and a monkey probably could, but unfortunately, you would be stuck with a human, doing a clerical job, deserving of no more that minimum wage, in truth the ideal candidate should be paying you to sit in the warm, drink your coffee and use your Internet connection. I'd require 40% of profits on that size of account because if you have an inherent edge, I understand how that edge can be best exploited, and I'll squeeze the last drop of juice out of it. If there's nonsense about discretion etc, then its a non starter, but if there's an edge I can trade it. Your choice really, pay a monkey peanuts, and absorb the losses, or take 60% of the profits, assuming you have an edge, and lets be frank, you don't have to look that far to find one. Nice try though, really fun listening to you all talk about your fantasy of making millions.. I am a business man , I will invest in some one if I have confidence in their ability to follow systems , I do not mind paying 40 % of what I earn , because in this game discipline is more important .I do no want your discretion , I do not want your edge ,my system has an edge.I just want you to xxxxxxx follow it without your emotions and mindset .If you could you would not need my money , but maybe you do not know my systems.It is the systems which make money , not the traders. A business man does not mind paying a higher price , , as long as he make money.He does not hire useless people without skills. Over the years, I've pretty much given away the basis of my edge is for anyone who wants it, and I have no shortage of capital, but always happy to take a look at opportunities. You won't get anywhere complaining on a forum, just get it sorted out. You know where I am if you need me. Hi, I feel so great to learn a lot from your professional traders’ dialogues. I am conducting trading in general online brokerage account with my money and my current yield is over100% this year with live accounts. Many thanks to God. (indeed, 80% profit is related to oil but I am not sure whether I still can sustain this kind of profit in the future) Market is great, not only it can provide opportunity to make money, but it also provides opportunity of liberty for the captive minds, like me. Most of my trading strategies are 80% focus on mental side. I found that most of times my strategies are kept changing and interacted with system. I found that it is formed during the trading process naturally; instead of set it up at the very beginning. So my strategies are dynamically interacted with the system. Here is my current strategy, pure mindset. I have two margin accounts and have a good profit. I had sensed that system may go to take my profit back, so I naturally formed a strategy. I put one of my account in idle (indeed, I withdraw all of my money out in order to avoid any trades I may made involuntarily; I use another system to control my system), then I conducted the cash trades in one margin account when I found the price fell in the safety of margin range(I think). That means I collect half of my profit in my pocket; on the other hand, I put my risks to minimum. So I felt more peace. Now I can play around with less stress since it is designed to reduce the risks during the process. Can I say my trading is 80% on mindsets but sometimes I cannot follow the rules since the games are always changing? Regarding to the stress, just have a question, if the trader kept reminding him that “it’s not his money” to reduce the stress, if the risks are coming, will he becomes more ignore the risks and results in lost more money since IT’S NOT MY MONEY? Will the “IT’S NOT MY MONEY” attitude mess up the risks since he does not really care about it from his deep heart? Just curious about your thinking. Thanks. Most interviewees claim to be professionals , competent , impressive and intelligent .You can not test them for trading wired mindsets at interview.They all want 40 % of profits and a fixed wage in advance ,irrelevant of outcome , until they have to perform on live accounts under stress , duress , losing days /sequences , choppy markets , junk science failure etc.If they were of a professional standard , they would not work for anybody else and make them millions . I might take you up on it , cause I know you have good knowledge and business skills .Right now , I am working with four trainees ,they cost me $25k a year fixed , rest is mine ....the millions and billions , and I can replace any of them with a wink , and train another one in four weeks.I keep training one or two in advance , so if one gets hocky cocky , I can fire them. I just trained a good guy in two weeks , to start trading as a pro , he has never traded before . I'm sure you could devise a series if tests if you tried. Even informing candidates that they'll be tested at interview will cut out the worst candidates, they just won't show up. Its no different to hiring software developers, give em a technical interview, and you can screen out 95% within the first 10 minutes. No idea what planet your on, but here on earth, no one asking for 40% is going to require a wage ! Similarly, don't even think about incentivizing a wage slave with a percentage of profits. Not even sure about professionals not working for others, I worked for someone else for as long as I needed to, and in turn I had one or two great people working for me before they in turn went off to do their own thing. If you have what you claim you have then there's 3 options, you sort it yourself, or you design the process so its idiot proof, and you monitor processes for compliance, or you find someone just starting out who might have most of the piece of the puzzle but who isn't quite ready to take the leap of faith on their own account. They'll all take the same amount of work, and all have advantages and disadvantages. You won't get very far just complaining about it here, you need to get it sorted. Hi, I learned a lot from your “edge” discussion. Honestly I do not know about the edge and I also have no idea whether there is an edge in the system. But market is my good friend. When he told me that there is a possibility of going to no edge, in order to make friend with him, I also need to be well prepared. Furthermore, the only thing I can control is ”me”, isn’t it? Thanks and cheers. I am actually going down this route , as there are many reasonably competent technical analysts (for entry signals) and data entry assistants (to manage trades) and some are willing to work a free week , to see their skills.This is better than hiring a pro , who can away anytime to go on his own. ....you do realise this has taken you back to where you where in the original post. 1....and you are right - most pros either wont take on your system as it either does not work, does not work for them or if it does they will then reverse engineer it and do it themselves. These days if its a simple system its not hard for anyone to automate and test most things. 2...If you believe enough in the system that it works and can be followed by a monkey (or automated) then you dont need to pay a lot.....but then it can be automated. If it requires discretion and needs more than a robot to work, then you are back at point 1, or it will cause the system to not work in which case you are loosing again. Everything is a trade off.....assuming you have a profitable system that should able to be followed by anyone - then you dont have a trading mindset problem but a business model problem. you mean trading can be tought? ....aren't you supposed to have the necessary skills?